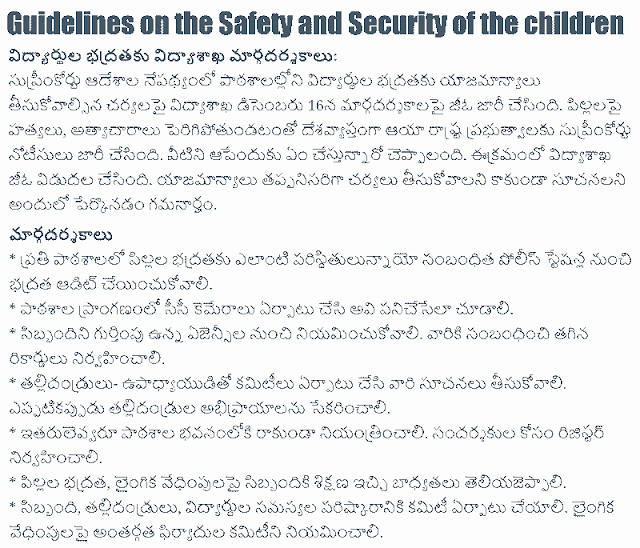 GO.No.36 - Steps to be taken for the safety and security of the children in the schools in the Telangana State. The safety and security of the children in the schools in the State is of utmost concern and importance to the Government. The responsibility for this safety and security of the children in the schools lies primarily with the school authorities. It is bounden duty of the schools to provide the environment to the children, where they feel safe and free from any form of physical or emotional abuse or harassment. Guidelines on the Safety and Security of Children, Guidelines for Safe and Effective use of Internet & Digital Technologies in schools and school buses, Protection of Children from Sexual Offences Act (POSCO) and Juvenile Justice Act,Model Education Code,POCSO (Protection of Children from Sexual Offence) Act, 2012, Guidelines on School Safety Policy, 2016, National Early Childhood Care and Education (ECCE) Policy,National Commission for Protection of Child Rights(NCPCR). 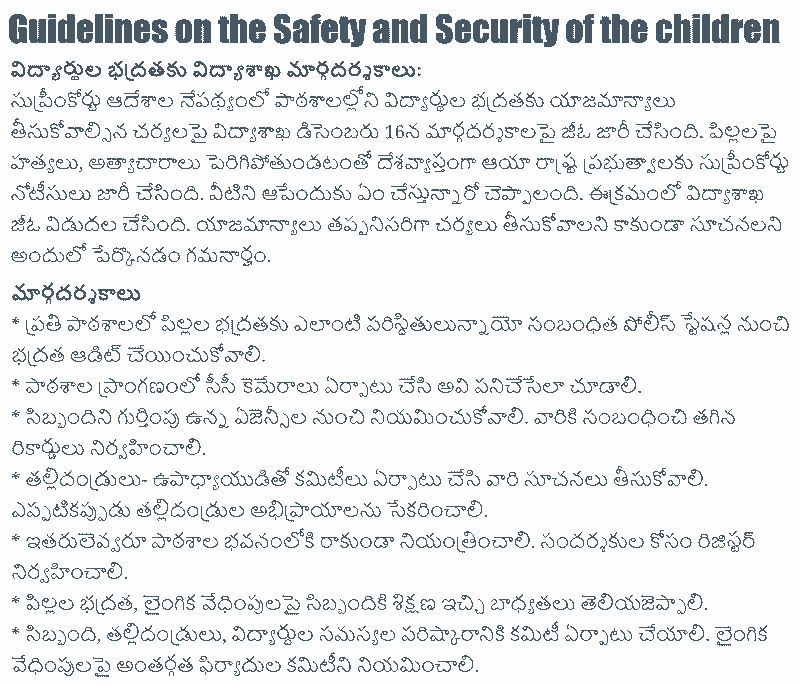 School Education - Steps to be taken for the safety and security of the children in the schools in the State - Instructions Issued. 1. From the Commissioner & Director of School Education, Telangana, Hyderabad, Lr. Rc. No. 564/PS.3- 1/PED/2017, dt.16-09-2017. 3. From the Asst.Registrar, Supreme Court of India, Notice in WP (Civil) No.874 of 2017, dated 23.09.2017. 4. Orders dt.30.10.2017 of the Honble Supreme Court of India in WP (Criminal) No.136/2017 with WP (Civil) No.874 of 2017 (PIL-W). 6. From the Commissioner & Director of School Education, Telangana, Hyderabad, Lr.Rc. No. 564/PS.3-1/PED/2017, dt. 07.11.2017. The safety and security of the children in the schools in the State is of utmost concern and importance to the Government. The responsibility for this safety and security of the children in the schools lies primarily with the school authorities. It is bounden duty of the schools to provide the environment to the children, where they feel safe and free from any form of physical or emotional abuse or harassment. (i) (a) Get the security /safety audit done of their premises and personnel from their respective local police station and follow the security related advice for the safety of the school children. (b) Install CCTV Cameras at all vulnerable areas/points in the school premises and ensure they are functional at all times. .
(c) Ensure that supporting staff is employed only from authorized agencies and proper records are maintained. (d) To constitute a Parent-Teacher-Students Committee to address the safety needs of the students and to take regular feedback from the Parents in this regard. (e) The access to the school building by outsiders should be controlled and visitors monitored. Maintain Visitors register for every entry and exit of all persons / staff / parents. (f) To provide training to the staff so that they discharge their responsibilities properly and promptly to protect children from any form of abuse. (g) The school shall constitute Committees for redressal of the Public/ Staff/ Parents/ Students grievances, Internal Complaints Committee on Sexual Harassment and Committees under POCSO (Protection of Children from Sexual Offence) Act, 2012 and details of these Committees along with contact details shall be displayed prominently on School Notice Board and conspicuously on the School Website for the information of all the stakeholders. (h) To engage lady conductors and provide separate toilets for drivers and the house keeping team etc. (i) Presence of a female attendant to be ensured for pre-nursery to primary sections outside the wash rooms / toilets / changing rooms in all the schools. (j) The children travelling by school bus should be the responsibility of the school from the time they board the school bus till they are handed over to their parents. (k) That a person employed with the schools, if found guilty/charged of any criminal offence / antecedents, besides Protection of Children from Sexual Offences Act (POSCO) and Juvenile Justice Act, should be immediately terminated. (ii) Implement the Model Education Code prepared by National University for Educational Planning and Administration in 2015. This can be viewed/ downloaded from http://www.nuepa.org . A hard copy of the same is also enclosed herewith as Annexure-I. (iii) Implement comprehensive set of Guidelines on the Safety and Security of Children issued by the Ministry of Human Resource and Development(MHRD), Govt. of India communicated vide D.O.Lr.No.10-11/2014-EE-4 of Addl.Secretary(SE) dt.09.10.2014. This can be viewed / downloaded from http://mhrd.gov.in . A hard copy of the same is also enclosed herewith as Annexure-II. (iv) Implement the Guidelines for Safe and Effective use of Internet & Digital Technologies in schools and school buses issued by CBSE vide Circular No.Acad-32/2017, dated 18.08.2017 communicated by MHRD, Govt. of India. This can be viewed/ downloaded from http://cbse.nic.in . (v) Implement the Regulatory Guidelines for the private ‘Play Schools’ framed by National Commission for Protection of Child Rights(NCPCR) communicated vide D.O.No.2501/13/2016-17/NCPCR/RTE/49579, dated 21.12.2016 of the Member, NCPCR, based on the National Early Childhood Care and Education (ECCE) Policy of 2013, of the Ministry of Women and Child Development, Govt.of India, New Delhi, issued vide No.6-3/2009-ECCE, dt.27.09.2013. This can be viewed/ downloaded from http://ncpcr.gov.in . (vi) Implement the Guidelines on School Safety Policy, 2016 prepared by the National Disaster Management Authority, Govt. of India. This can be viewed/ downloaded from http://www.ndma.gov.in . 3. The Commissioner & Director of School Education, Telangana, Hyderabad, is directed to take necessary action to communicate these Guidelines to all the unaided/aided private schools and schools affiliated to different Boards in the State. He must also ensure that the above Guidelines are followed scrupulously by all the schools and any violation / lapses with regard to implementation of these Guidelines will invite stringent action against the school managements, including withdrawal of recognition / NOC of the school concerned.